Planning your estate or talking about death and discussing your legacy with your family as uncomfortable as it may seem, will not bring the day closer but instead will give you a soothing peace of mind. In fact that is exactly how I refer to what is commonly known as a basic estate plan - the peace of mind plan. (5) an advance healthcare directive (provides instruction for end of life decisions such as life support, organ donation, burial/cremation arrangements). Probate is the court supervised distribution of your estate or all assets to which you hold legal title to your heirs. Probate proceedings are costly and time consuming; they can take seven months to two years or more to complete. For example, in San Francisco a home priced at $700,000, could incur up to $76,000.00 in fees before your heirs could inherit the net proceeds. This does not include court fees, extraordinary costs or the personal expense of family infighting. Despite popular belief, having a will DOES NOT avoid probate. Each lineal heir (your children or your brothers and sisters) has equal say so in your or your parents' estate in probate proceedings. 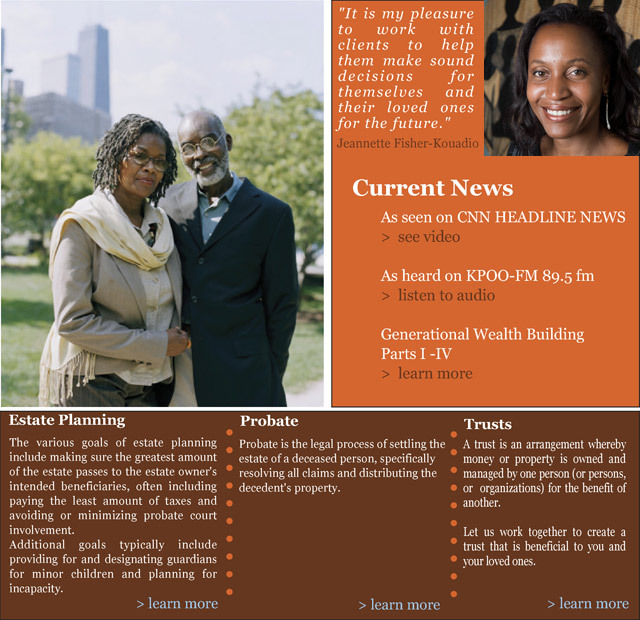 For further discussion of the importance of having at least a Basic Estate Plan to avoid the high costs and time- consuming nature of the probate process; the resulting family disputes and devastation that often occurs in the absence of an estate plan, and to provide incentives and guidance to heirs (see full article at: www.meenanewspaper.com.